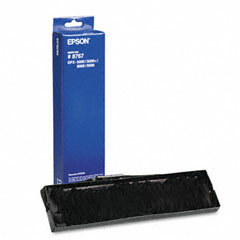 Premium Quality 8766 Black Printer Ribbon (6 pk) compatible with the Epson DFX-5000, 8000, 8500. The use of compatible supplies does not void your printer warranty. Premium Quality 8766/8767 Purple Printer Ribbon compatible with the Epson DFX-5000, 8000, 8500. The use of compatible supplies does not void your printer warranty. Premium Quality S015384 Black Printer Ribbon (1 pk) compatible with the Epson DFX9000. The use of compatible supplies does not void your printer warranty. Premium Quality S015384 Purple Printer Ribbon compatible with the Epson DFX9000. The use of compatible supplies does not void your printer warranty. Genuine OEM Epson 8766 Black Printer Ribbon. (6 pk) They are designed to work in the Epson DFX-5000, 8000, 8500 printer/copier(s). Genuine OEM Epson 8767 Black Fabric Ribbon. They are designed to work in the Epson DFX-5000 printer/copier(s).